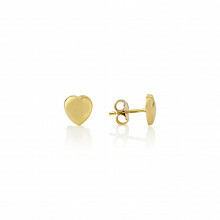 Cute studs in Yellow Gold, partly layered with White Gold. A little pair of Earrings with a lot of appeal: sweet, meaningful and a little quirky twist of design. Surely the perfect gift for your favourite person?